While driving to the dentist with Big Sister E recently, I realized that I had forgotten my phone at home. From the amount of muttering and angry glances I kept giving at my purse (since it was the purse's fault that the phone wasn't in there, of course), it struck me just how dependent I've become on this single device. After being used to having so many capabilities, conveniences and ways to stay connected at my fingertips at all times, the act of being so... disconnected can leave me feeling a little lost. Which is no wonder that so many people cringe at the idea of actual loss or damage happening to their phone. Unfortunately, it happens more often than we realize. As I mentioned in my recent RadioShack giveaway, July is the worst month for cell phones due to the water, heat and outdoor activity that all present dangers and increase the likelihood of damage. 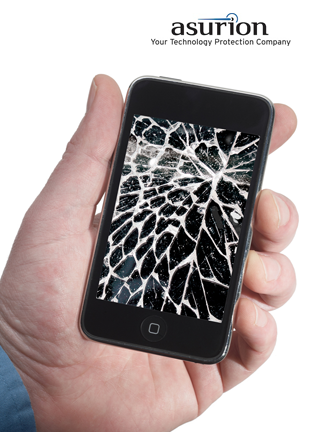 Are you one of the many who have had a lost, stolen or broken cell phone? According to Asurion, you're in good company, as their reports show that 60,000,0000 people in North America will lose, damage or have their phone stolen this year. That works out to over 164,000 per day, 114 every minute or nearly two every second. Yikes! Content and/or other value provided by our partner, Asurion. Over the years I've had my share of cell phones (many of which now have a place in my daughters' pretend play gear) and have had a mobile mishap or two where time moved in slow motion as I watched the phone slip from my hand, pocket or bag and fall to the ground. No matter how careful you think you are or how much you assume Oh, it won't happen to me, someday it will be your phone that is shattered on the sidewalk or being pulled out of the swimming pool or toilet! While I have always assumed that the only option for a broken or missing phone was to clean out your wallet and purchase a new one, I was then introduced to Asurion, the global leader in providing consumer technology protection services across three continents. Understandably, people are eager to start using new mobile devices just as soon as they get them, but purchasing phone protection during the first 30 days of device use should truly be a priority – not to mention being the best and easiest way to have peace of mind. Asurion makes it easy because they work directly with your provider to provide the insurance you desire. The complete Asurion protection package, available through most wireless companies, empowers you with the apps and services that put you in the driver's seat so that you can enjoy using your smartphone. You'll rest easy knowing you're protected with Asurion, whether you need technology to secure your data privacy against growing mobile threats, need a device expert who is just a call or click away, or coverage to replace your phone as quickly as the next day. Our cell phones have quickly become beloved treasures in our lives that manage to keep us easily connected to family, friends and work, while also keeping us organized, acting as storage for photographs, and much more. What would you do if all of that was suddenly gone? 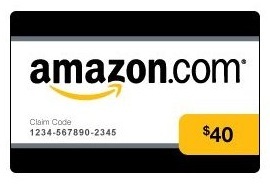 One lucky person will win a $40 Amazon gift card from Asurion! A big thank you to Asurion for providing a $40 Amazon gift card for me as well as for one lucky giveaway winner. The opinions shared are my own and honest and if you really need to see more, click here to see how I roll. When I had my old phone, thankfully not my iPhone, I went to do laundry one day not knowing my phone was in my sheets. I washed it while I washed my linens....opps...that was the end of that. I have dropped my phone on the floor several times, luckily it has survived, so far. I've left my phone on the trunk of the car and then ran over it. My teenage son cracked the screen on his htc incredible and we had no upgrades available. Teenagers cant live like that, ha! i dropped my phone off my bed and the screen COMPLETELY shattered. apple replaced it with a new one, though! I dropped my phone as I was getting out of my car onto the concrete. It had a few scratches, but still worked thankfully. I was still very upset. My mishap is my husband. He keeps loosing his phones! We are on our third in two years. I've dropped my cell phone on the pavement and cracked it. my daughter dropped my new smartphone on a hardwood floor and shattered the entire front screen. The glass was sticking out in pieces. This was the same night was other daughter was bit in the face by a dog. It was a very expensive night, to say the least. I have left my phone outside in the rain! Shockingly, I have been lucky! I have had several friends with toilet mishaps, though. I've been lucky -the worst I've ever done is drop my phone and scratched it up. But my husband dropped his iPhone on concrete and shattered it. I've had friends who dropped theirs in toilets, pools, and one even ran over hers accidentally. I havent had anything crazy happen, a friend of mine got pushed into a pool when she had her iphone on her. I haven't had anything bad happen yet but i do have insurance on my phone just in case. Did i just jinx myself? i ran over my last phone! Most of my phone accidents come in connection w/ water- spilled water bottle, toilet, pool & coffee cup! My hubby put his cell phone thru the washing machine! I've had problems with everyone cell phone I've owned. Usually they will drop calls or won't receive messages or calls. It's so aggravating. My sister dropped her phone in the toilet! I left my phone on our stairs and my boyfriend stepped on it. It was completly broken. I washed (and dried) my husband's cell phone two weeks after we bought it. Whoops. While on vacation in Gatlinburg last summer, he put his phone in the pocket of his swim trunks while we walked to the pool. He forgot to take it out and jumped in the pool. His phone never recovered. We had to stop on the way home to Indiana at a Verizon store to get a new phone. My brother ran his though the washing machine. I dropped my cell phone on my hard wood floor and the entire back piece shattered. My friend found her boy giving her phone a nice bath! I dropped my phone and the screen is now broken into many little pieces. My best friend left her cell phone on the hood of her car and drove away. The phone was never to be found again! I had my phone stolen while substitute teaching 2nd grade. My daughter dropped my phone in the toilet while we were on vacation. My sister got a new blackberry phone last year and within 3 hours of getting it, she dropped it in the river while sitting on the pier! I forgot my phone was in my pocket and I jumped in my pool. Thank you for the chance to win! Our problem with cell phones is loing them, somewhere somehow. My daughter dropped my phone in the toilet. I dropped my phone in the parking lot at work and the entire screen cracked! Luckily the phone still worked! I also accidentally dropped my phone in the toilet while out and about at the children's museum! Whoops! I've dropped my phone in the toilet a few times. I left my phone on the roof of my car and later returned to find it in our street, in pieces. I once dropped my phone in the Chicago River during an architecture cruise! When I worked at Magic Kingdom, I once lost my phone on the track of the ride I worked at. Got it back a few hours later- a little scratched up but otherwise ok! Leave a comment on this post telling me about a mobile mishap that happened to you (or someone you know). I dropped my phone in a train station, and the parts shattered all over. I have been lucky, my friend though got pushed into a pool with her cellphone in her back pocket. My husband drove off after leaving his cell phone on the roof of his car. It got run over. I dropped my cell phone and cracked it. I know people who have dropped their phones in the toilet! Nothing serious (yet) just drops. I have dropped my phone in the toilet and most recently I handed my phone to someone to take a picture and they dropped it into their red solo cup full of adult beverage. My sister unknowingly dropped her cell phone while getting out of the car. The next morning, she ran over it with her car! Scott accidentally dropped his cell phone in the toilet :) *Thanks* for the giveaway! One time after my wisdom teeth extraction i got distracted and dropped my phone in a glass of root beer. I accidentally dropped my phone face down on cement right when I was going to put it in my purse to prevent it from being dropped accidentally. Ironic isn't it!? The screen was shattered too. It would have been nice to have Asurion to help out in this situation. My friend got her phone wet when we were at the beach. Was carrying the phone in my pocket- I was shocked and horrified, but I actually managed to have it fall out into a toilet!!! OMG yuck. Surprisingly, after cleaning it off in clean water and taking it apart and letting it dry out, it is okay!!! My husband dropped his in the river. My mobile mishap happened when I dropped my iPhone and cracked the screen. I broke the screen on my iphone and I did not have insurance to cover it. I dropped my phone at the park...although it looked totally normal, it wouldn't even turn on. I had to buy a new one, and I lost all my info/photos/appts, etc., because I hadn't backed it up! my husband dropped his phone into the fryer at work (cook). My granddaughter decided that the area where the headphone goes into was the perfect place to try to fit a banaana! accidently dropped my phone in the pool!! I've never had a mishap with my phone except for dropping it all the time, however a coworker of mine once dropped his phone right into his pitcher of cranberry juice! I dropped my phone in a toilet. My dog chewed up my cell phone. I'm currently using a phone with a shattered screen, because I dropped it in the parking lot at work. I had a phone drop in the tub once. What a mess that was! My friend and I accidently walked into a giant puddle (at night in Rexburg, ID so brrrrr) and instead of turning around, continued walking thinking it might get shallow but instead walked waist deep and both our phones were trashed. My iPod Touch slipped out of my pocket and ate the pavement! My first touch screen phone I ever had, I dropped on the cement as I was unlocking my door--smashed the whole front so I could never see who was calling lol. My son dropped his phone in the lake while fishing. I was talking on my cell phone while doing dishes and I dropped it in the sink . Dropped my phone in the cats water dish by accident. Nothing major. Just had a drink spill next to it. It wasn't me, but my son. I had just bought him this really neat cell phone. As we were walking out of the Verizon store, he dropped it and chipped the corner and now it doesn't open like it's suppose to. My hubby's phone just died. His antenna stopped working. I dropped my iPhone getting out of my car. Two year old and a toilet, nuff said! I havent done anything horrible to mine, but my aunt dropped hers in the toilet...seems to be pretty common! My son's phone quit working after he used in the rain. I dropped mine on the tile floor and it would never work again. I lost my phone at one time and found out later that Emily left the phone on the bumper of the car. It fell off while driving down the road and was run over until it was folded in half. My last mishap was leaving it in a restaurant. I once accidentlly dropped it into a glass of soda and fried it. Put phone in shirt pocket. Bend over to flush toilet. Oops. I've been really lucky with my phones...no mishaps...I have a good cover on it. A friend of mine did drop his on the sidewalk and the screen cracked all the way across. I placed my cell phone on the trunk hood of my husband’s car while we were working in the garage. I just forgot to tell him and he took off down the road. We never did find it. I dropped 2 phones in the toilet in a week. My husband ran my phone over with the lawn mower. Yes, true story! ugh! A coworker dropped it into cement that was the beginnings of a house foundation. Luckily I haven't dropped my phone. Yet. my 2year old grand daughter threw my phone in the toilet. Tried to flush it I had to reach in and grab it. YUCK! My phone fell out of my pocket into a dirty litter box while cleaning the litter. Ew. A coworker dropped theirs in the toilet! I would love to win an Amazon.com gift card. I left my phone on top of the car when I was loading in my three dogs to go to the dog park. I had a gripped cover on it so it stayed on the roof until I passed the toll booth and saw it fly off. dropped my cell phone on the floor but was able to put it all back together. I dropped my phone in the garage and chipped it up. Luckily I had a shade of nail polish that matched it almost exactly, and was able to touch it up so it looks almost like new! My cousin dropped and FLUSHED her phone! I washed my old iphone in the washing machine. I didn't realize until it was too late and full of soap. My mom dropped her phone in her coffee not just once, but twice. My 1 year old son threw my old phone in the bath tub before! I have accidently lent mine to "Mr. Hanky." Once I dropped my phone in the bathtub while bathing my son! Mishap- dropped cellphone while tending an outdoor campfire. I dropped mine in the toilet! I was pushed into a lake and had my phone in my pocket! my son threw my phone down the stairs (he was 2). I've dropped my phone into a glass of water (accidentally). My husband dropped his phone in the snow and when he realized it he went back to look for it just to realize he had drove over it! Husband lost it in a snowbank, found it 2 months later, dried it out and charged it and it worked! I haven’t really had any mobile mishaps. Just accidentally calling people when I’m just meaning to look at the contact list. I had a water bottle leak in my purse and destroy my phone! i recently ran over my phone! it dropped out of my bag and didnt realize it...oops! I've dropped 2 separate phones into my coffee! My daughter had a nightmare with LG phone. It just stopped working for no reason. It was a new phone and the company was NO help. She was over a week without a phone because they insisted that she mail it in and give them a chance to fix it. When returned it did the same thing. Just stopped working. Finally she was given a new phone but approx 2 week ordeal. She does not have a landline and lives alone. Talk about not save and a company that didn't care. I once cracked the screen of my cell phone. My friend said his phone was "washed". I thought it was a techno term until he explained "no, it went into the wash... with my jeans". My husband dropped his on our side step and shattered the screen. I washed my daughter's phone in the washing machine after she left it in a pocket. Ouch! I was getting out of my car and had my phone on my lap. (which I forgot about it) it fell straight onto pavement and I shattered my screen! I have a friend who dropped his Iphone into the lake. He did recover it but it was never the same. My husband kept his in his lap during a basketball game and when he got up to cheer, it flew away and cracked really bad. Yikes! I had my phone in my pocket and forgot. I threw the jeans into the washing machine and it went through the entire washing cycle. I did not know about the rice trick and I turned the phone on to see if it would work. We had funeral services for the phone the next day. My best friend had one as well when she forgot her phone was in her pocket when she decided to take a dip in her pool. My friend has dropped her last 3 phones in the toilet. My mom actually dropped hers in the toilet - at least it was actually clean! I dropped my phone in the park and had to drive back and find it.